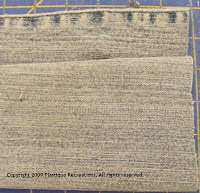 Since posting my Blue Jean yarn in Etsy, I've received several requests for a 'how-to'. Below are the steps I take to make blue jean yarn. I welcome your feedback. If you do it differently, I would love to know how you do it. Take a pair of blue jeans and cut the legs off at the crotch. Lay pant leg flat on cutting surface with one seam on top and other seam on bottom. 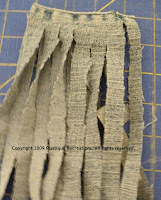 (If you have a really sharp rotary cutter or good scissors, this can also be done in a double layer. Not sure I would go more than that but feel free to give it a try.) Cut off the bottom seam. Keep each strip in a separate pile. After all jeans are cut up, either by hand or with your sewing machine - stitch the ends of each strand together with clear thread. You now have 1 very, very long strand. Quite honestly, the blue jean yarn is ready to go now. Feel free to get out the knitting needles or crochet hook and let the creative juices take over. I used a single ply, so really either an 'S' or 'Z' twist is sufficient. It really doesn’t matter because you're just wanting to achieve that tight twist affect. Thanks so much for your tutorial! It is a wonderful idea. I have 2 large tubs of blue jeans that need something done with them. Thank you again. Thank you for the kind words. You would be amazed by all the things you can turn into yarn using the continuous strand cutting method. Thanks for sharing! I just thinking about other stuff I could turn into yarn. THANK YOU -Finally, verification that my idea had merit - Thank you!!!! Now to develop a pattern for a VERY VERY simple knit sideways longish vest. I love all your tutorials, thank you so much for doing them! 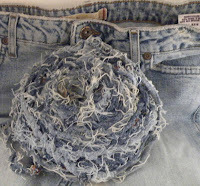 Do you still recommend doing blue jeans as a tube, or would you now recommend cutting the seams off first and cutting them as you do other pants and sheets? Thank you Tammi for the kind words .. and you're very welcome. That's really good question but a tough call because the upside to using the tube method - the cutting is sooooooooooooo much faster, the downside is you're taking a real chance of ending up with lots of small pieces come out of the dryer and what pieces still have seams intact may come out from a pull or tug of the hook/needles. It depends on where you want to save the time, on the front end or back end because that's really what it ends up being. 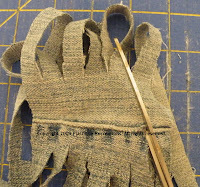 Tube method saves time on the front end but the compromised seams results in many undone pieces out of the dryer and then sewing the pieces together. 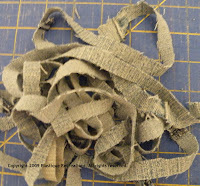 Continuous strand method has a more lengthy front end cutting time with virtually no sewing time when it comes out of the dryer. The only sewing I typically do is sew the ends of the 4 strands together so I don't have to worry about it while I'm crocheting/knitting with it. Sorry for such a lengthy answer but wanted to give you some insight to my response. 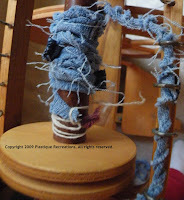 I haven't tried this yet, but a suggestion to keep the yarn from tangling in the dryer...wrap it into a loose skein. You can use a straight-backed chair back. Tie one end of the yarn around one of the posts of the chairback and carefully wrap the yarn in a single layer around the chair back. When you reach the end of the yarn, untie the first end from the chair and then tie the two ends of the yarn together ina bow. Next take 3-4 pieces of contrasting scrap yarn (so you can see it to cut if off later, I usually use embroidery floss for my regular handspun yarn, but you might want something thicker with the denim yarn). Now divide your skein in half and thread the scrap yarn through so that you can tie it together into a figure eight. Do this is 3-4 places equally around the skein. Now you can slip the whole thing together off the chairback. This should theoretically keep the yarn from untangling in the wash and dryer stage. Maybe putting the loose skein of jean yarn in a lingerie bag to wash and dry might stop the tangling a bit. I am curious why you wash the jeans after cutting them if they are already clean? Does this step have to be done? I have washed t-shirt yarn done in this fashion in order to dye it and it does come out of the dryer a tangled mess. 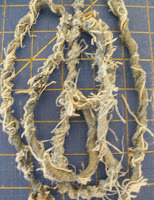 Washing after cutting is how you achieve the frayed look and it's a good way to test the strength of the yarn. It's an optional step - it does not have to be done. However, if the finished design is something that might get washed later, there's a strong possibility it'll fray then.